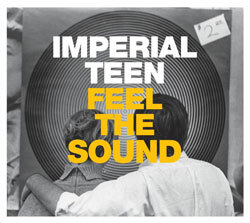 Imperial Teen’s releases over the past 20+ years have been pointed and specific diaries of musical celebration, windows into the hypersensitive personal drama of relationships within the band, individual conquests and failures, and collective, aspirational hopes, dreams, and perspectives. Roddy Bottum, Will Schwartz, Jone Stebbins, and Lynn Perko Truell—who they’ve become, how they are dealing, and what their lives are in 2019—all of this is on Imperial Teen’s forthcoming release Now We Are Timeless. The band wrote and recorded the new album in the cities the individual members have geographically gravitated to: New York City, the Bay Area, Denver, and Los Angeles. Themes of time and movement, averting and succumbing to crisis, dealing with loss and pain are all represented on the record, but what rings triumphant is the undeniable joy and catharsis that come from the band’s spontaneous and improvisational approach to making music together. The juxtaposition of the title and the imagery of the cover of Now We Are Timeless takes us immediately to the heart of what Imperial Teen does best. By focusing on an element in the collective here and now—an iceberg in the midst of ecological crisis, clearly sinking, melting, disappearing, the absolute antithesis of timelessness—they pose the question of hope and beauty in the wake of age, a fading icon shining brightest in the final phase of its demise, exuding light and glory as the world falls apart. Now We Are Timeless indeed. In strict keeping with the band’s roots of creating seemingly clean, pop presentations as a springboard for dramatic themes of loneliness, triumph, suicide, success, and failure, Now We Are Timeless moves us into a realm of inevitability for the band. While Seasick, the band’s first release, thematically touched on the queasiness of pop and beach and sun and glare and the optimism that lies beneath, the new release serves as a bookend of sorts in its portrayal of a world in crisis, a frostbitten but melting iceberg, monolithic and stationary yet impermanent and resonant. What has remained constant over the years is Imperial Teen’s indisputable knack for writing profound hooks as a framework for their musical memories. Their songs exhibit the realness, joy, and energy that only good friends can conjure.